Studies indicate that 1 in 3 U.S. adults aren’t getting enough sleep, which can adversely affect one’s productivity, creativity, memory retention, quality of life, heart, appearance, immune system and weight. Lack of shut-eye also greatly affects mental health — even partial sleep deprivation can have a significant impact on your mood, which includes feelings of stress, anger, sadness and overall mental exhaustion. All of these emotions can make it even more difficult to sleep, thus creating a vicious cycle. While it takes a little structure, it is possible to get the required amount of sleep in an effort to boost your mental well-being — here’s how. One of the basic elements of getting proper sleep is establishing a sleep schedule so that you’re waking up and going to bed at the same time each day — weekends included. Establish what time you need to wake up in the morning and work backward seven or eight hours in order to know what time to hit the hay. If you’re more of a night owl, use the same approach in reverse — consistency is the important factor, so find a time that works best for you and stick to it. It’s important to only go to bed when you’re actually sleepy, otherwise you run the risk of developing insomnia by lying in bed awake. It used to be believed that exercising before bed was a bad idea because it energies the body and mind, but experts say this is not always the case. In fact, for some people, having a sweat session before bed doesn’t affect their ability to sleep at all — or it has the opposite effect by making it easier to drift into dreamland. Weight training in particular is known for improving sleep no matter what time of the day the activity is performed. Experiment with exercising during different periods of the day to determine what works best for you. 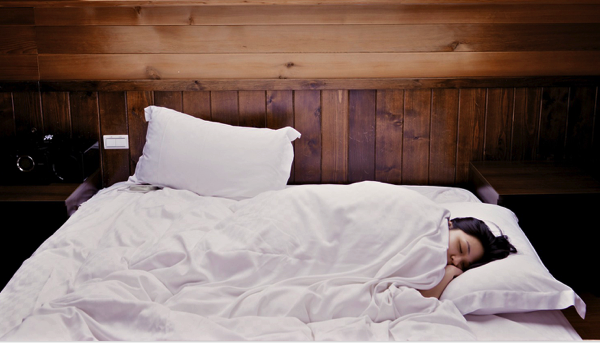 Consider your bedroom a sleeping sanctuary that should only be used for resting. Invest in a quality mattress, but make sure to do your research first. Once you’ve narrowed down your options, it can behoove you to give them a try. Take off your shoes and lie down in the various positions in which you normally sleep. It can take up to 15 minutes to truly feel the support of a mattress, so don’t rush this step or you could regret it later. Other bells and whistles to consider for a restful sleep include a white noise machine that airs ambient sounds such as crashing waves, blackout blinds or curtains and an aromatherapy diffuser. Temperature is key, too, so turn down the thermostat to a comfortable 60-67 degrees Fahrenheit. The worst things you can do right before going to bed are stressful tasks such as paying bills or being attached to any form of electronics from your cell phone to the television — power them down at least one hour before lights out. Instead, take time to wind down with a relaxing ritual such as creating a to-do list for the next day, clearing up any residual clutter, downloading a guided meditation app, writing in a gratitude journal, sipping herbal tea, taking a relaxing bubble bath and lowering the lights. Experts suggest that adults between 18 and 64 get seven to nine hours of sleep, while seniors 65-plus get seven to eight — teens, young children, toddlers, and babies need even more. Getting too much sleep can also lead to unhealthy behavior, so it’s important to stick within a reasonable range. If you’re still struggling to sleep despite instituting good habits, speak to a specialist about your treatment options before the situation adversely affects your mental and physical health on a larger scale. Proudly powered by CoAbode and Single Moms.